To gain a healthier relationship with food & their body. To reduce mindless eating and binge eating. To eat in a way that supports both the brain & the body, or meets & cognitive functioning. Attend to picky eating with children. We know how and what we eat impacts our health. So I share education & therapy from the areas of mindful eating & nutrition psychology to positively impact the health of my clients. From a mindful eating perspective: being present with and freeing ourselves of distractions while eating our food helps us get into rest & digest mode, as well as heightens our awareness of how & what we eat. From a nutrition psychology perspective: the food we eat impacts our moods & our cognitive functioning, no matter our age. Today on CTV I shared a recipe featuring the flavours of Fall for adults, & a Halloween-inspired treat for the younger audience! 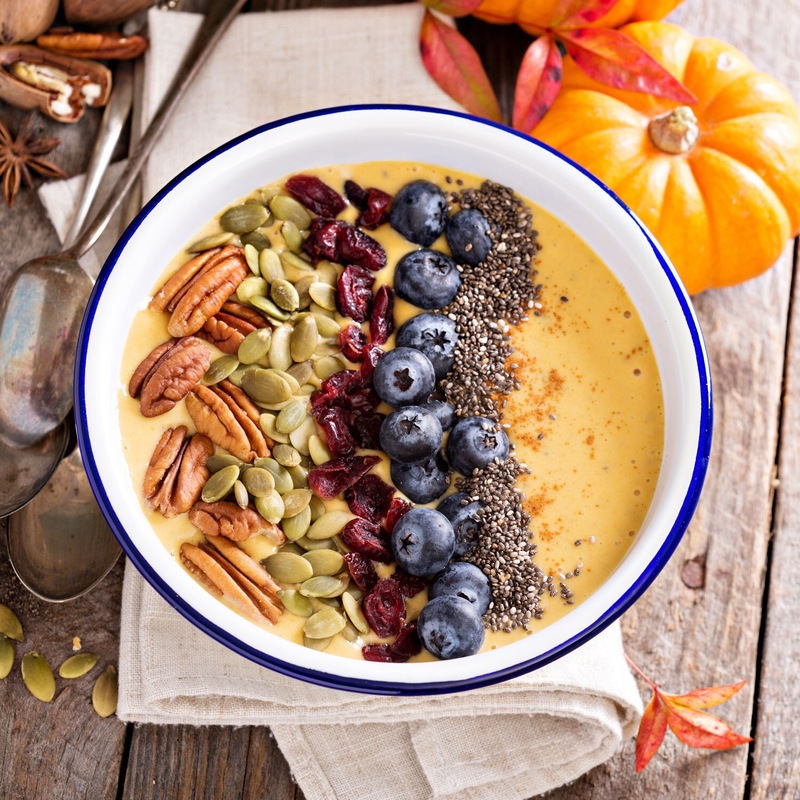 The PSL (aka Pumpkin Spice Latte) smoothie bowl for grown ups, & the Halloween pumpkin smoothie bowl for a caffeine-free version. These smoothie bowls offer up a balanced breakfast that’s comforting, nourishing, unprocessed, & EASY to make! What’s the deal with smoothie bowls? Compared with smoothies you sip with a straw, the base of the smoothie bowl is slightly thicker, with an almost ice-cream like consistency. The colourful base is served in a bowl that can then be artfully decorated with any toppings your heart desired. Designs can range from simple — sliced banana, pumpkin seeds, yogurt — to over the top — a quick search online of smoothie bowls & you’ll find serious works of smoothie art such as remakes of classics like the Mona Lisa! Of course, it’s not always possible to make a smoothie bowl for when you’re on the go. Either pop the thick smoothie in a wide mouthed thermos or add some extra milk or coffee to thin out & put in a temperature stable bottle like a Swell bottle! Use the smoothie bowl as a vessel to get supplements for brain & body health. From probiotics, to fish oil, the prebiotics and more. I do this with my 2 & 5 year old! Freeze your bowl full of smoothie for a few minutes before topping. This helps make a firmer base for toppings to rest on. You can prep ahead. Place your portioned smoothies/smoothie bowls in a reusable baggie or container, pull out of freezer an hour before blending. I buy pre-peeled & frozen ripe bananas from Spud.ca, & always have on hand in the freezer! If you don’t want to brew your own coffee, I buy local Blackbird Cold Brew Concentrate & always have on hand in the fridge for recipes like this! Get mindful with your meal prep! Make a work of art on your canvas — your smoothie bowl!